An early 19th century Secretaire cabinet in the manner of George Oakley, the upper gilt metal gallery over a pair of glazed cabinet doors flanked by barrel form cabinet doors enclosing adjustable shelves. 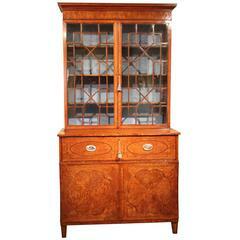 The Secretaire cabinet is fitted with solid Satinwood adjustable shelves enclosed with a pair of fielded cabinet doors. 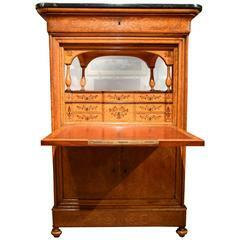 The Secretaire drawer is fitted with cedar lined drawers and cedar lined pigeon holes. Dimensions Height 59" 150cm Width 33" 84cm Depth 15" 38cm All of the items that we advertise for sale have been as accurately described as possible and are in excellent condition, unless otherwise stated. Please note that we are also able to arrange a full shipping service for our customers. We look forward to being of service. WH6854.